The following machinery will accept pre cut-to-length blanks of 0.5mm stainless steel and form into the tension bands at a speed of 20m/min. 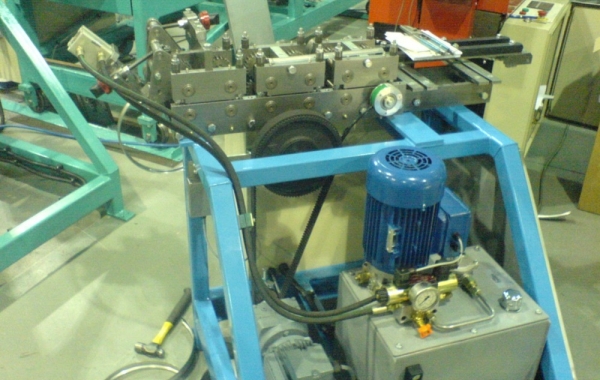 The rollforming section of this machine consists of rigidly fixed one-piece sideplates which carry the bottom roll shafts and tools. 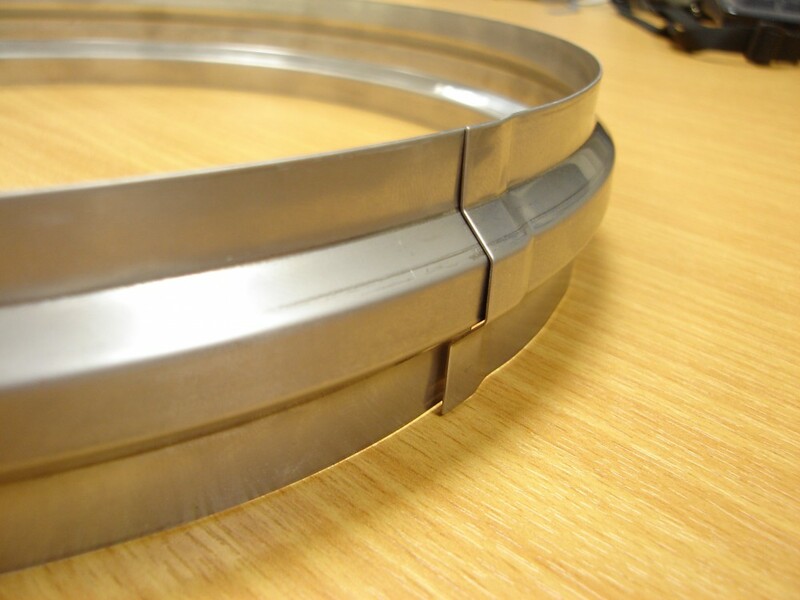 The roll shafts are carried in re-greasable needle roller bearings. The top roll shafts are similarly mounted within upper bearing blocks, which allow individual adjustment for rolling centre and forming pressure. 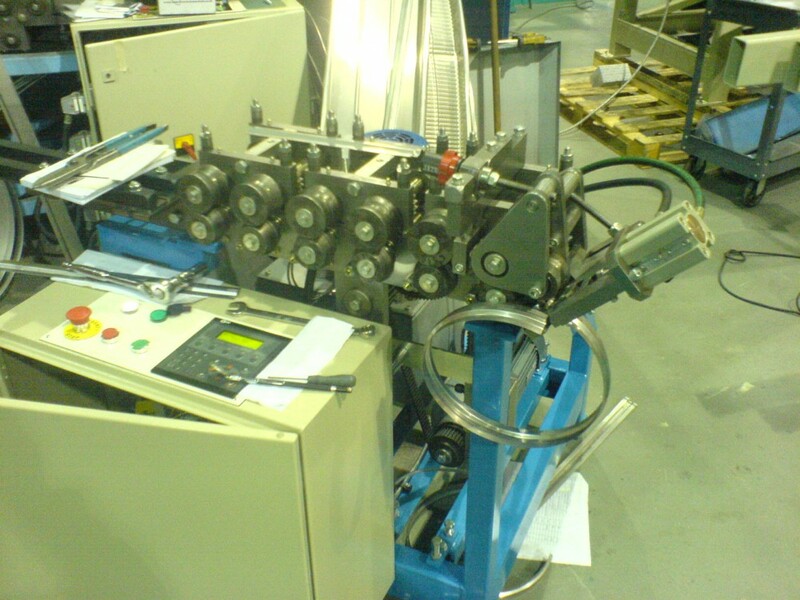 The tooling is cantilevered on the outside of the sideplates and bearing blocks, to allow for easy product ejection at the end of the machine. 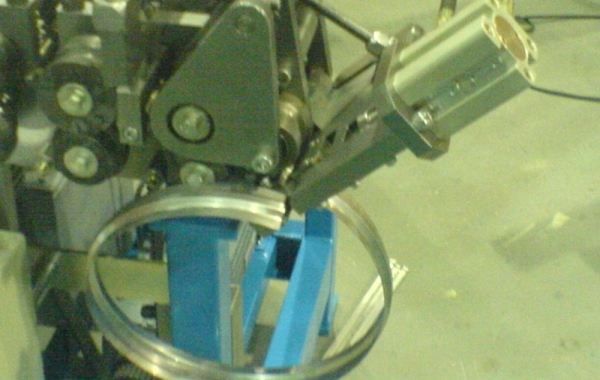 The bearing mounted profiled ring roll is pivoted about the centre line of the last form roll and adjusted by a screw adjustment mechanism, with digital position indicator for repeatability of settings. 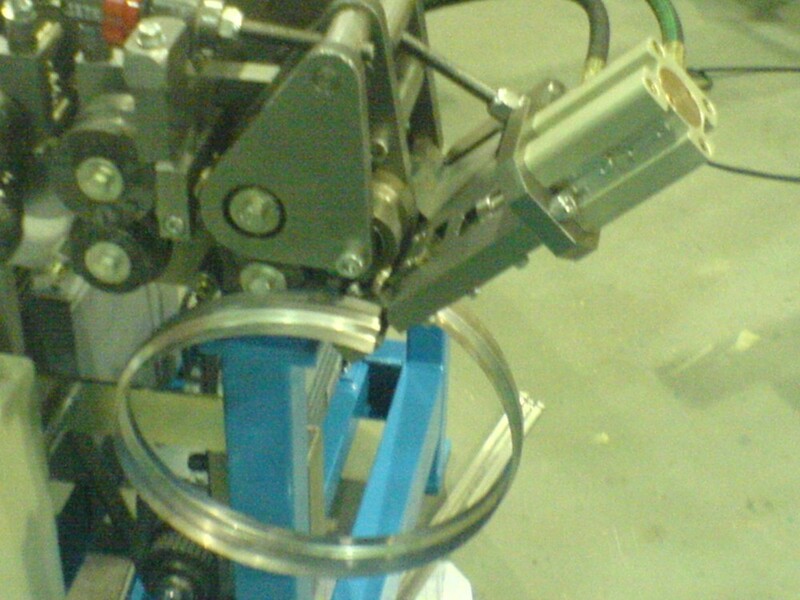 A fixed inter-station idler roller provides a positive reaction for the curving process. The compact no-loss profile shear-head is situated immediately following the ring-roll attachment so that it cuts the curved profile at the desired position. 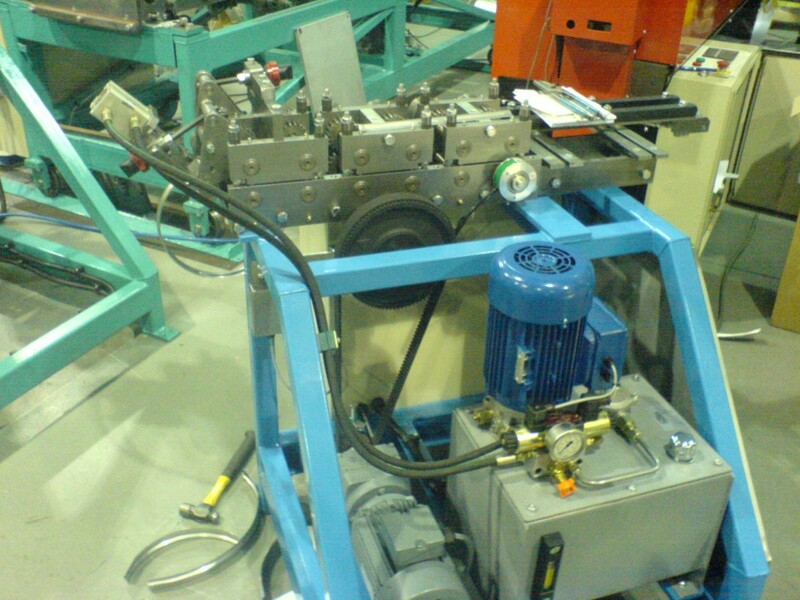 This head is operated by hydraulic cylinder, via the integral electro hydraulic power pack, in a stroke and return time of approximately 0.5 seconds, under control of the microprocessor PLC unit. 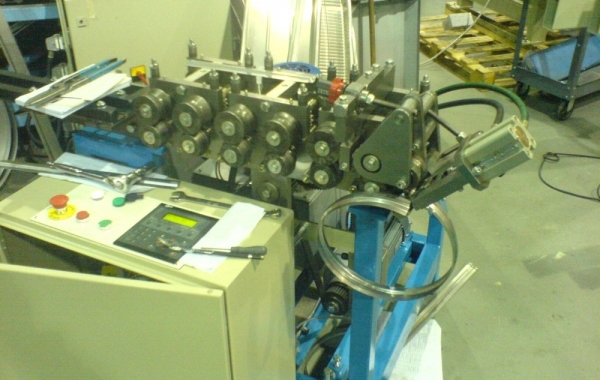 The head is carried by a multiple linkage assembly, adjusted in tandem with the ring roll adjustment to position the head angle and position, in accordance with the curve required. A fine positional adjustment hand wheel with digital indicator is provided for accurate positioning of the head and repeatability of settings. The shear blades have been designed to joggle one end of the band during shearing so it sits over the other end without an internal step. The electrical control cabinet fitted to the side of the machine carries all necessary electrical controls, including the fully programmed microprocessor PLC along with the main inverter drive. 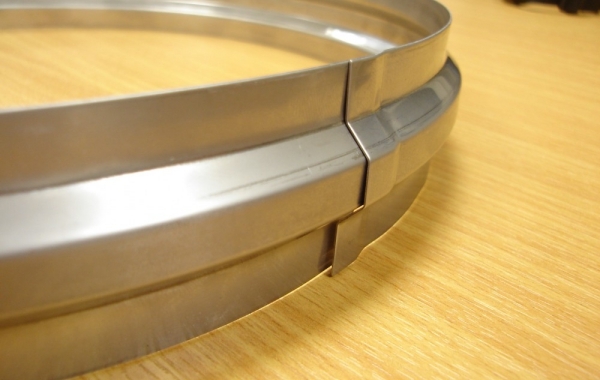 This provides the cut-to-length accuracy to ± 0.5mm. The simple operator controls consist of power ‘on’ and ‘off’ push buttons and illumination along the operator HMI. This keypad and display unit provides prompted entry of the desired product diameter and batch quantity and adjustment of length related parameters. Error messages are displayed when necessary to simplify fault finding.